The weather has warmed up a little at last, the bulbs are flowering and I’m beginning to believe that there is an alternative to winter. And, even better, sitting on my desk at the moment are the first goose eggs I’ve managed to find this year. That means simply the best scrambled egg known to man or woman – or at least known to me. All that and a new album by Elbow – things are really looking up. While I was thinking nice thoughts about the spring I decided to make some friands using hazelnuts rather than almonds. Quite why hazelnut cakes make me think of spring I shall probably never know, but they are light, very tasty and make me happy so they seem suitable. The last time I made friands I got into a discussion about what the difference might be between friands and financiers. You could consider at length differences in flavourings and techniques, but essentially I think it comes down to the fact that friands are a funny shape and often speak with an Australian or New Zealand accent. You can make these in cupcake or muffin moulds if you don’t have a friand tin. This recipe will make 10 – 12, depending on the size of the mould. Oh, and I used ordinary hens' eggs for the cakes – you can bake with goose eggs but there's no way I'm giving up my scrambled eggs. Preheat the oven to 180°C. Prepare the friand tin by brushing carefully with melted butter. Sieve the icing sugar, flour and ground hazelnuts together into a large bowl and mix them together. Whisk the egg whites just until they're frothy – you only want to loosen the egg whites, not make them stiff. Gently stir the egg whites into the dry ingredients until they're thoroughly combined, but don't overwork the mixture. Now gently stir in the melted butter and the frangelico (if you’re using it). Finally, stir in the chocolate and lemon zest. Spoon the batter into the tin – each hole needs to about ¾ full. Bake in the oven for 20 minutes until lightly golden and springy to the touch. Allow the friands to cool in the tin for a short while before removing them and transferring to a rack to cool completely. By the end of winter I feel as if I’ve eaten several lorry-loads of parsnips since Christmas and I’m looking around for something different to do with them. This recipe is based on one way I saw them being cooked in France, although I've complicated the dish quite a bit. I've often heard British people say that the French don't use or even know about parsnips – in fact I heard Mr H Fearnley-Whittingstall say something to that effect on the telly not so long ago. That might have been true once upon a time but parsnips turn up in a large number of French recipes and restaurants these days. This dish is very straightforward, but you have to start a few hours before you want to eat in order to allow time for the socca batter to rest. Of course, if you happen to have a wood-fired oven sitting around doing nothing, then feel free to cook the socca in that. I used slices of excellent Bury black pudding, but, if you can find it, Stornoway black pudding is also excellent and might be even better suited to this dish. I intended this dish to be a starter for two but I've just found out (by eating it) that it makes a good lunch dish as well. For the socca, sift the chickpea flour into a bowl to get rid of any lumps, sprinkle the salt over it and then add the water in a steady stream while whisking until you get a thin, smooth batter. Cover the bowl and leave it alone at room temperature while you go and do something useful or interesting. An hour’s resting will do but three is better. (Some say leave it longer, but I don’t think that helps). Once the resting time is complete, pour the olive oil for the socca into a 21cm square roasting tin and heat it in the oven at 200°C for 5 minutes. In the meantime, stir the fennel seeds and black pepper into the socca batter. Once the oil is nice and hot, remove the tin from the oven, quickly pour in the socca batter and put it back in the oven for around 15 minutes. The socca is done when it starts to look relatively stable and begins to brown round the edges. Remove from the oven and allow it to cool in the tin for a few minutes. It’s pretty much inevitable that the socca will break up when you remove it from the tin, but the amount given here should give you plenty to allow for breakages. Simply take two biggish chunks and neaten them up with a sharp knife. Or you could just not bother and go for a rustic, falling-apart look. When the socca is nearing the end of its cooking time, fry the slices of black pudding in a small amount of oil. Reheat the parsnip mash. Place the slices of socca onto warmed plates, top with a slice of black pudding, place a neat dollop of mash alongside and adorn the top of the black pudding with a little of the vinaigrette. Finish with a few cheffy drops and drizzles of vinaigrette around the plate. 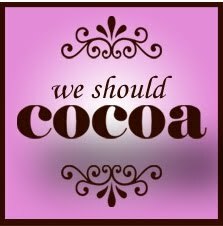 For the March We Should Cocoa challenge Chele of Chocolate Teapot has chosen lime as the ingredient to be used with chocolate. My first thought was to combine these two with mango, which I know can work well, but that felt a little too summery to me. So it was chocolate cake time again. The cake in question is a flourless sponge with added grated pear. The pear is there partly because I think pear and chocolate work well together in cakes but is mostly there to keep the cake moist. The effect is to produce something that, for me, is a bit like a lighter version of a brownie. The idea of adding fruit comes from an Australian recipe (a Dov Sokoni recipe, I think) that I saw a dozen or so years ago. That recipe added apple to a chocolate cake – sounds odd but I promise it works. For the topping, I’ve used a very simple frosting based on lime curd. The recipe below will make too much lime curd for the cake (in fact, it will make about 2 standard jars) but I don’t think it’s very practical to make a smaller amount. Anyway, if there’s any spare, then I’ll come round and eat it. If you prefer, you could just serve the mascarpone and lime curd mixture alongside the cake. The cake should divide up into 8 (or more) pieces, but be careful when handling and cutting the cake, because it can be a little fragile. To make the lime curd, set a bowl over a saucepan of barely simmering water – make sure that the bowl isn’t touching the water or the curd is likely to overheat. Put the sugar, butter, lime juice and zest into the bowl and stir until the butter has melted and the sugar has fully dissolved. Add the eggs and keep stirring until the curd thickens and coats the back of a wooden spoon. You could keep the curd in the fridge if you’re going to use it quickly, but I was traditional and put it into sterilised jars. To make the cake, grease a 21cm square cake tin, preferably a loose-bottomed tin if you have one. Grease the tin carefully since the cake is prone to sticking. Preheat the oven to 170°C. Thoroughly beat the egg yolks with the caster sugar until they’re very pale. Stir in the pear, chocolate and ground almonds until fully combined. Beat the egg whites to the stiff peak stage and fold them in. Pour the mixture into the prepared tin and bake in the oven for around 35 minutes. The baking time for this cake can vary depending on the moisture in the pears, so test with a skewer or knife point after about 25 minutes and continue to check regularly. The skewer should come out clean when the cake is ready. Allow the cake to cool in the tin for 5 minutes or so before carefully turning out onto a rack to cool completely. To make the topping, simply beat together the mascarpone and lime curd and add as much or as little icing sugar as seems right to you. To serve, cut the cake up into rectangular chunks, spread with the topping and rough it up with a fork. 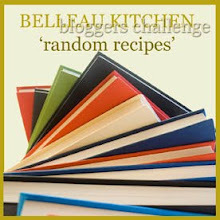 It’s Belleau Kitchen Random Recipe challenge time again and for this month’s challenge the magic number is 18. So I chose the bottom shelf of books and counted 18 from the left. My random choice last month was a chef’s book of French recipes and so, for a complete change, this month’s random choice is a chef’s book of French recipes. (Not all of my books are cheffy French recipes, I promise). This month’s book is Pierre Koffmann’s ‘La Tante Claire’ published in the early nineties. (M. Koffmann, incidentally, has fairly recently resurfaced in Knightsbridge.) On the random page – 21, as it happens – is the recipe for ‘Gâteau aux Noisettes’. My first thought was that this would be a cake made with ground hazelnuts but it’s actually quite different. The finished dish is more like eating a French tart with a crisp base and a softer topping, filled with nuts. It makes a pleasing and easily-made dessert, although only if you really like hazelnuts. Although the gâteau isn’t large, it should easily feed 6 since there’s a limit to how many nuts you can eat, unless you’re the squirrel that lives at the bottom of my garden. It’s best served with a crème anglaise – M. Koffmann suggests a hazelnut crème anglaise. I've made some very minor adjustments to the recipe in the light of experience. Preheat the oven to 180°C. Chop the hazelnuts into halves – you don’t need to be too precise about this. Butter a 19 cm round cake tin – the tin needs to be about 3 cm deep. Mix together the sugar and flour and then rub in the butter until the mix feels uniformly sandy. (Incidentally, I'm coming round to thinking that rubbing in butter is just about the least interesting job you can do in the kitchen, other than cleaning the oven. I found that listening to the latest Decemberists album helped.). Place half of the mixture into the prepared cake tin and spread it out evenly. Whisk together the sour cream, baking powder and the egg and then stir this thoroughly into the remaining half of the pastry mixture. Pour this into the cake tin over the base that you’ve already made, making sure that it’s spread evenly. Sprinkle the chopped hazelnuts over the gâteau and bake in the oven for 35 – 40 minutes. After this time, the top should be set but still moist. Allow the gâteau to cool before removing from the tin. About this time of year I begin to really miss the days of summer when I can wander out to the garden and pick fresh veg and herbs. There's not much out there at the moment but two things that have survived the winter and are still looking good today are the Cavolo Nero and some late-sown chervil plants. It was too tempting to ignore. So this recipe is loosely based on a River Café pasta dish combined, probably rather inelegantly, with a French sauce made of chervil, garlic and walnut oil. A week or so ago I heard a pompous Italian gentleman saying that all civilised people would agree that Italian olive oil is the best in the world and buying anything else would be a form of madness. A few days later I heard a pompous Frenchman saying pretty much the same thing about French olive oil. As a result I used Spanish olive oil for this dish. This should be enough for 2 people. Italian varieties of kale aren't essential for this recipe, but the flavour and colour of cavolo nero is excellent. Blanch the kale leaves in boiling, salted water for about 3 minutes (it might take a little longer if the kale is particularly tough). Drain the kale thoroughly and put in a food processor with the garlic and the chervil. 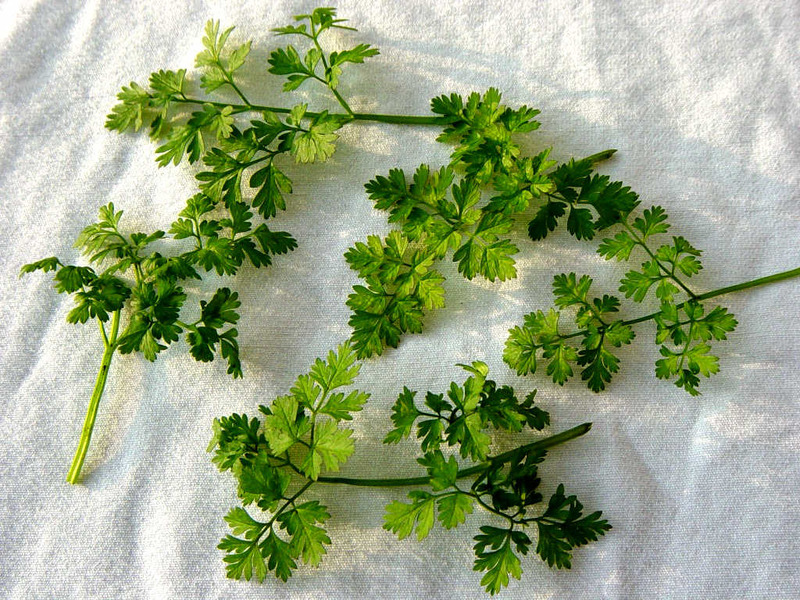 Process briefly to chop up the leaves, then pour in the walnut oil and 30 ml of the olive oil. Process until you get a dark green paste. Season well. Mix freshly-cooked farfalle into the sauce, adding a dash of the pasta cooking water and as much of the extra oil as needed to give a nice coating consistency. Add a squeeze of lemon and grate over some parmesan just before serving - don't add the lemon too early or you might spoil the deep green colour. I was going to take a picture of the finished dish, but it got dark. But we all know what pasta looks like anyway, I suppose.